The National Parks Photography Project is much more than just a photography exhibit. Centered around the Centennial Anniversary of America’s National Park Service in 2016, it will celebrate and pay tribute to the important role that the visual image has played in the history and creation of our national parks. This adaptation of the national park theme into an exhibit offers a wealth of unique visual, informational, and design possibilities. The rich history and heritage of our national parks, incorporated with the inherent elements of nature’s scenic grandeur... script a distinctly American story. Of course there is the obvious... our cathedrals of nature, the majestic lands that define the parks. But long ago, there were the early painters and photographers that first captured this natural beauty on canvas and film. In many cases, once these paintings and photographs were viewed by influential politicians back east, the artists work sometimes became more instrumental in the land becoming declared a park than the work of leading businessmen and scientists. While a portion of the exhibit will pay tribute to those early painters and photographers, the core of this exhibit celebrating the centennial of America’s National Park Service is the timeless Black and White photography of American Photographer Mark Burns. These photographs will be made from 2011 through 2015 yet printed in Black and White in a timeless and traditional style. One iconic photograph will be selected from each of America’s 59 national parks. The exhibit will feature unique display components and signage modeled after the traditional look (or Parkitecture) of America’s park buildings. 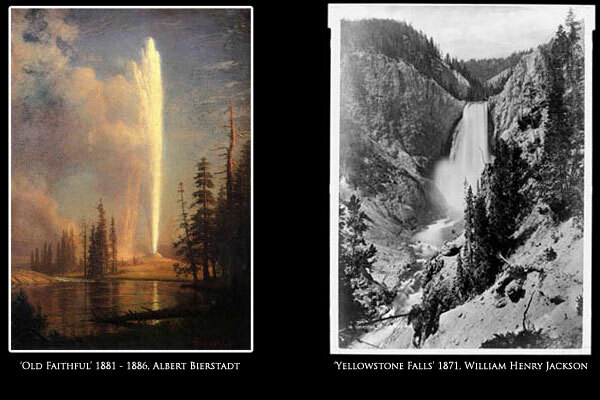 This special ‘Centennial’ photography section will consist of timeless Black & White landscape images produced of each of the fifty-eight national parks... Contemporary photography, photographed in a style paying tribute to the work of the early photographers working in America’s national park lands; while at the same time illustrating a core value of the national park ideal... that nature’s vistas within each park are seemingly unchanged since park designation. Each image will be printed to the highest archival standards on fiber-based exhibition quality paper. Finished prints will be framed utilizing archival conservation methods and materials. All original photography and print-making will be done by acclaimed American Photographer Mark Burns. The National Park Foundation, the official charity of America’s national parks, raises private funds that directly support and enrich America’s nearly 400 national parks and their programs. Chartered by Congress in 1967 as the nonprofit partner of the National Park Service, the Foundation’s philanthropic legacy truly began more than a century ago when private citizens took action to first establish, then protect and endow our national parks. They were people from all walks of life, united in their devotion to protect the places they love, and the places they knew would matter long into the future. Today, the National Park Foundation carries on that tradition as the only national charitable partner directly supporting the parks, playing a critical role in conservation and preservation efforts, establishing national parks as powerful learning environments, and giving all audiences an equal and abundant opportunity to experience, enjoy and support America’s treasured places. Basic exhibit display-space design will center around several free-standing units or inter- linked modular wall sections designed to allow entrance and exit visitor flow from the outer gallery into an interior display space. These modular units will vary in size according to the individual display space requirements of each exhibit area. The exterior and interior look of these modular ‘rooms’ will replicate the distinctive adobe, stone and wood architecture commonly found in America’s historic national park buildings and out-buildings. Most exhibit signage will replicate the dark brown wood with routed-out white lettering styled signs commonly used throughout the parks. The year 2016 will mark the Centennial Anniversary of America’s National Park Service. Few themes can match a venue more perfectly than America’s rich national park & National Park Service history exhibited within a Presidential Library venue. Since Abraham Lincoln first signed the bill protecting the Yosemite Grant in 1864, Presidents and Congress have been integral in the creation of our national park system. The combination of America’s grandiose scenic wonders, and a Centennial Anniversary make for a worthy and significant photography exhibition. The exhibit will then be available to travel to potentially two to three additional presidential library venues, (or other suitable venues) during the next year (or more). *The actual Centennial Anniversary year of the National Park Service is 2016.